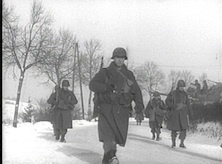 This DVD about the 90th Infantry Division takes place in World War II Europe during Late 1944 and Spring of 1945. 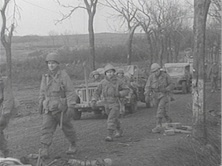 This DVD from our The Bulge and Beyond Series begins here and continues through to the middle of March 1945 as the 90th Division attacks across the Moselle for the 2nd time. 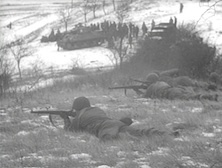 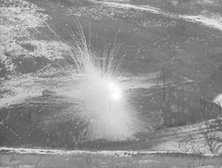 The contents of this video show the action as was recorded by the 166th Signal Photo Company, during these historic operations. 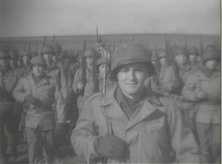 The footage in this video is intended to be strictly that of the 90th Infantry Division and only shows other unit footage when two or more units are intertwined. 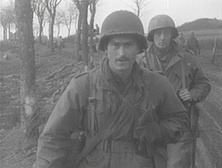 Combat Reels has thoroughly researched and compiled all of this raw combat film footage, then reformatted it into the DVD format for your viewing pleasure. 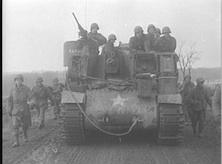 Great for veterans, families, military historians and military enthusiasts, this DVD has many different scenes of 90th Infantry Division soldiers and attached units.
. 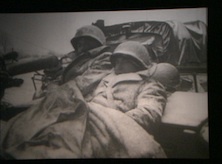 Listen to some raw sound of 90th soldiers and others receive their awards while at a rest camp in Le Harve. 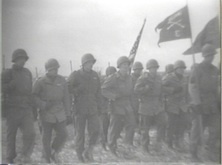 Witness a Presidential Units Citation parade for a 90th unit while moving through Germany. 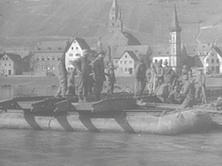 The series ends with scenes of engineers with the 90th building bridges over the Kyll and Moselle Rivers.